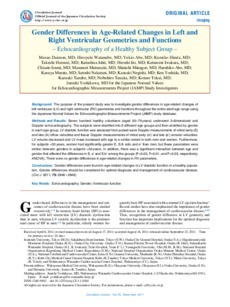 Background: The purpose of the present study was to investigate gender differences in age-related changes of left ventricular (LV) and right ventricular (RV) geometries and functions throughout the entire adult age range using the Japanese Normal Values for Echocardiographic Measurements Project (JAMP) study database. Methods and Results: Seven hundred healthy volunteers (aged 20-79 years) underwent 2-dimensional and Doppler echocardiography. The subjects were stratified into 6 different age groups and then stratified by gender in each age group. LV diastolic function was assessed from pulsed wave Doppler measurements of mitral early (E) and late (A) inflow velocities and tissue Doppler measurements of mitral early (e') and late (a') annular velocities. LV volume decreased and LV mass increased with age to a similar extent in both men and women. Furthermore, for subjects <�50 years, women had significantly greater E, E/A ratio and e' than men, but these parameters were similar between genders in subjects >�50 years. In addition, there was a significant interaction between age and gender that affected the differences in E, e' and E/e' among the groups (P�<�0.03, P�<�0.01, and P�<�0.03, respectively; ANOVA). There were no gender differences in age-related changes in RV parameters. Conclusions: Gender differences were found in age-related changes in LV diastolic function in a healthy population. Gender differences should be considered for optimal diagnosis and management of cardiovascular disease.